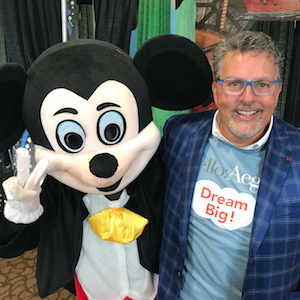 Aegis Living founder and CEO Dwayne Clark hangs out with Mickey Mouse at Aegis Living's 2017 Dream Big Lottery. The drawing included eight all-expenses-paid vacations to destinations including Disney. Editor’s note: This is a version of an article that appears in the 2018 McKnight’s Professional Development Guide. Download the entire guide here. It’s no secret that recruiting and retaining employees is the biggest challenge facing senior living and long-term care operators. Survey after survey back up with data what providers know anecdotally. In February, for instance, specialty investment bank Ziegler reported the results of a poll of senior living chief financial officers that found that staffing and labor issues are by far their biggest concerns. They were cited as top worries by 79% of the not-for-profit company executives who participated. Sometimes it takes some creativity to stand out to current and prospective workers. Wexford, PA-based IntegraCare’s Continued Attendance Rewards program, fittingly known by the acronym CAR, gives employees an extra reason to come to work every day. Those who do are eligible for a prize drawing in which the top award is a car. Other offerings include televisions, weeks of paid time off, computers and more. Employees enter the contest with vouchers they receive for each pay period based on perfect attendance. “We ask our residents and their family members to encourage our team and help make our communities better places to work, which in turn make them a better place to live,” IntegraCare CEO Richard Irwin says. The program, begun in 2016 to recognize 2015 attendance, has had several positive effects, according to the company. IntegraCare’s overall annual turnover rate, for instance, decreased 12% in 2017 from the previous year, and the number of IntegraCare employees with perfect attendance increased 46% in 2017 compared with the previous year. Bellevue, WA-based Aegis Living is thinking big, too. The company holds an annual “Dream Big Lottery,” where it gives away all-expenses-paid vacations as a way to thank workers for their loyalty and commitment. Employees who have been with the company for at least three years are eligible — and the longer workers have been employed at Aegis Living, the more chances they have to win. Last year’s trips included five to Disney theme parks, two to a dude ranch and one to New York City. “This kind of employee benefit not only serves as a unique and innovative employee perk, it gives families a chance at a dream vacation that some might not be able to otherwise afford,” says Aegis Living founder, Chairman and CEO Dwayne Clark. The vacation giveaway and more traditional but not necessarily common benefits are what helps Aegis keep its annual staff turnover lower than the industry average, according to the company. Other offerings, according to Aegis Living, include competitive compensation, training and advancement opportunities, profit-sharing, “soft” benefits such as “Appreciation Days” for time off, and discounts on massages, haircuts and prepared meals from community kitchens. Sometimes a big payoff for employment longevity with an operator may be delayed but still potentially very valuable. That’s the case with a benefit offered by Virginia-based English Meadows Senior Living. In 2017, the company announced a new perk for long-term employees: free care at their places of employment after retirement. “We felt that if someone dedicated their lives to a company, they should be able to participate in what the company offers to the public,” says Mike Williams, co-owner and CEO of English Meadows. After 20 years of service, workers are eligible for a free year of care at the campus where they worked. The benefit grows to two years at 30 years of service and three years after 40 years of service. The median stay at independent living/assisted living/memory care communities is 28.1 months, according to the 2016 State of Seniors Housing report of the American Seniors Housing Association, so the perk is expected to cover almost everyone’s needs. Nine of the company’s more than 160 employees across three campuses already had qualified for the benefit at the time of the announcement, according to the company. That includes three employees with more than 40 years of service. Benefits packages for many hourly, full-time workers at English Meadows also include free health insurance, free disability insurance, maternity pay options and a 401(k) match. When it comes to assisted living, turnover is especially problematic among certified nurse aides and workers in dining services and environmental services, according to the 2018 “Assisted Living Salary & Benefits Report” released in January by the Hospital & Healthcare Compensation Service. Some providers offer opportunities for advancement through education as another way to attract, develop and retain top talent. West Point, PA-based Acts Retirement Communities, for instance, has a tuition reimbursement program that is available to any employee who enrolls in a job-related course of study. Those pursuing associate degrees are eligible for up to $4,000 per year; bachelor’s degrees, $5,000; master’s degrees, $6,000. The organization offers a tuition pre-payment program for employees who make less than $29,000 per year. Additionally, the Acts Corporate University program offers lifelong professional and personal learning opportunities — some at a discount — on-site and through several educational institutions. ACU also sponsors leadership academies, GED and citizenship support, professional development for employees to obtain and maintain licenses and certifications, and e-learning. 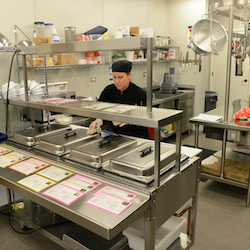 With an eye toward the future, the organization offers a formal mentoring program designed to support succession planning involving high-potential employees as well as several scholarship programs for high school students, including one for students who plan to study culinary arts in college. 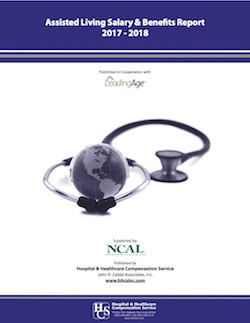 Brentwood, TN-based Brookdale Senior Living launched its health and wellness tuition reimbursement program in 2016 to encourage RNs and LPNs to pursue a career path to the health and wellness director position, one of three top leadership roles, along with executive director and sales director, at Brookdale communities. Health and wellness directors can obtain $3,500 for tuition reimbursement after their first year of employment and another $3,500 after the second year. A separate tuition program is available for other employees who have worked at Brookdale, the country’s largest senior living community operator, for at least one year. Any specific perks offered to employees are part of a larger culture that reflects an organization’s efforts to make workers feel valued and important and, therefore, more likely to stay and tell friends about job openings. Some employers offer financial enticements for those referrals. Two changes last year at Holiday Retirement, the country’s largest operator of independent living communities, as well as the desire to “stay relevant,” presented the opportunity — and the necessity — to reinvent the company’s culture, says Karen Sheean, the organization’s senior vice president of human resources. Holiday needed to hire more than 150 people when it relocated its headquarters from Lake Oswego, OR, to Winter Park, FL, and needed to attract additional people at the community level when it changed its management model from one that relied on live-in managers to a more traditional structure. The organization’s culture-change effort, Sheean said, has extended down to the place where first impressions are made: recruiting and orientation materials. New and existing employees will help shape the work environment, too, Sheean said, through a new, 22-member Culture Council. Employees representing various departments within the company will serve six-month terms, during which they will share ideas and make decisions such as how the company will become involved with the greater community. “It’s not just one group’s job anymore to build the culture; it’s all of them,” she said. Similar to Acts, Holiday offers professional development — covering everything from safety issues to leadership skills to company-identified career-path necessities — through its free online Holiday University program. Employees can be certified as community team leaders through online learning and in-person mentoring then have the potential to be general managers. They receive handwritten thank you cards and special name badges in recognition of their achievement and capability to assume a general manager role when one becomes available. Sometimes the smaller perks are the most effective, Sheean says.